Sheldon has over 14 years of experience in the food service industry. He shares how he first got involved in cooking and why he set his sights on spices and seasonings. 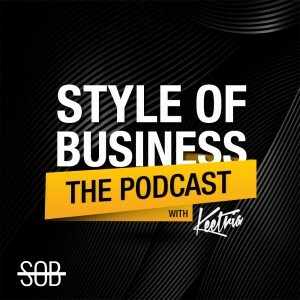 In this 38nd episode of SOB: Style of Business podcast, Keetria interviews Sheldon Davy, the founder and CEO of Don Williamson’s Handmade Creations, an organic spice line. Sheldon has over 14 years of experience in the food service industry. He shares how he first got involved in cooking, why he set his sights on spices and seasonings, and what his strategies for marketing and building awareness have been. His love for food began at a young age, when he would get creative with whatever was available. His parents exposed him to a wide variety of culinary styles. The inspiration for Don Williamson’s began when Sheldon’s mom returned from Italy with some exciting seasonings, and he felt spices could be what he could use to make himself standout in the culinary world. To get awareness out he sends out samples to get people to share the experience of his flavors. Salt often covers too much of the flavor, and needs to be adjusted. Creativity and curiosity are elements of Sheldon that come out strong with cooking. Sheldon enjoys Jamaican food, curry, oxtail, jerk chicken, Italian food, authentic Mexican food, Korean, and Chinese food. Having reservations about starting new things is natural. Experience is the best teacher. Sheldon is motivated by starting from the bottom and enjoying the process. Direct-to-consumer is the focus he has for distribution using online stores and Amazon. Networking through social media with like-minded people by collaborating with other up-and-coming artists has been beneficial. No matter what age you are, realize you won’t know everything—remain open-minded and humble. Don Williamson’s began when Sheldon’s mom returned from Italy with some exciting seasonings, and he felt spices could be what he could use to make himself standout in the culinary field. – “When cooking for others…you just have to have the balance.” – Sheldon Davy. – “Culinary just gives me a platform to be creative.” – Sheldon Davy.